This is such a traditional clean eating meal with a twist. 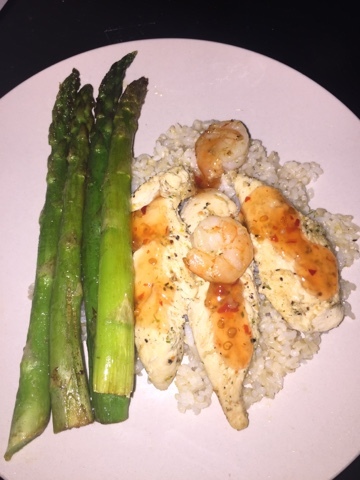 I sautéed 4 small chicken breast and 3 shrimp and also sautéed fresh asparagus in garlic and soy sauce. 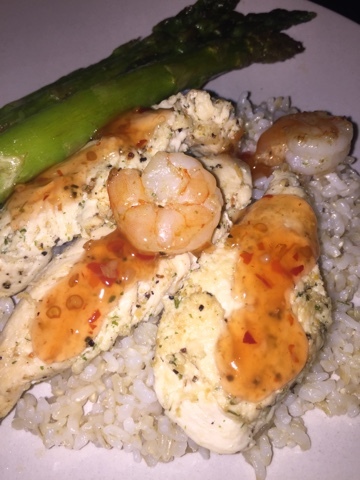 When both were done I laid them on top of a bed of brown rice and drizzled a little bit of sweet chili sauce onto the chicken and shrimp, YUMMY!!! This was so good, I'll be adding sweet chili sauce to more of my food.